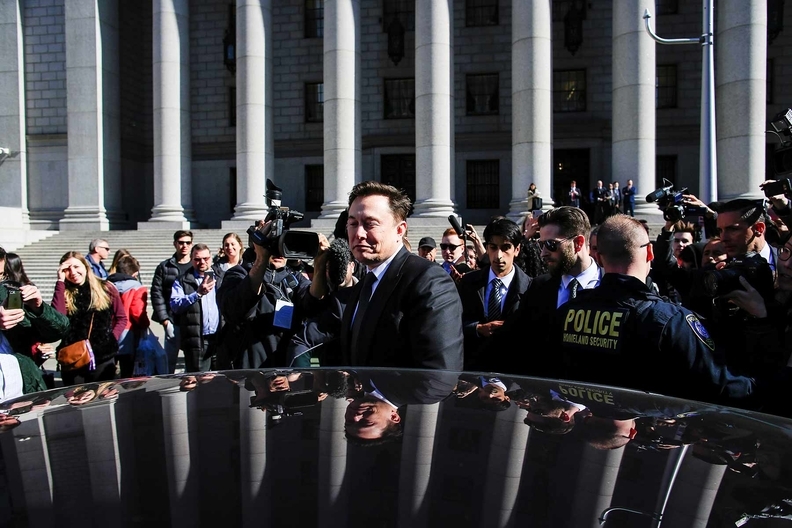 Tesla CEO Elon Musk leaves Manhattan federal court after a hearing on a fraud settlement with the Securities and Exchange Commission in New York on Thursday. NEW YORK -- A federal judge in Manhattan on Friday ordered Tesla Inc. CEO Elon Musk and the U.S. Securities and Exchange Commission to meet for at least an hour to try to settle the agency's concerns over the billionaire entrepreneur’s use of Twitter. The Feb. 19 tweet said: "Tesla made 0 cars in 2011, but will make around 500k in 2019," meaning 500,000 vehicles. Four hours later Musk corrected himself, saying annualized production would be "probably around" 500,000 by year end, with full-year deliveries totaling about 400,000. The SEC said the first of the Feb. 19 tweets conflicted with Tesla's Jan. 30 outlook, when it targeted annualized Model 3 production exceeding 500,000 as soon as the fourth quarter, and projected 360,000 to 400,000 vehicle deliveries this year. Tesla shares rose 2.7 percent to close at $274.96 on Friday.